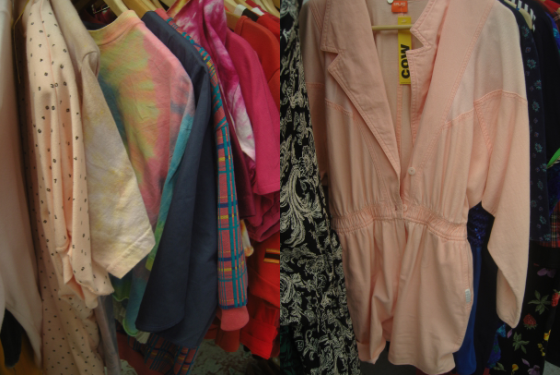 Here's a video of the haul I got when I went shopping with Winnie. It's a two parter because I just can't get them down to ten mins! I watch videos when I'm painting my nails, I'm thinking blue this weekend! I'm going to be filming tomorrow as a judge on Frock Me on T4 omgggg! They have a blogger for each episode and I'm the one for Birmingham so I hope it all goes OK! Hello, hello! I'm back from Paris and have had interviews all week; is there anything worse than a group interview? But last week the day before my flight (woo, no ash! 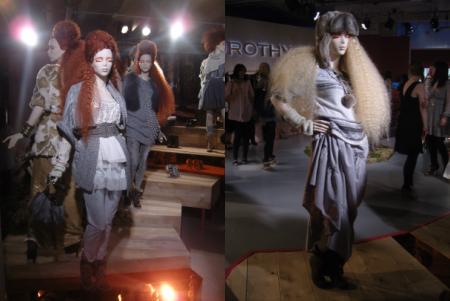 ), I went to the Arcadia AW10 press day in London! 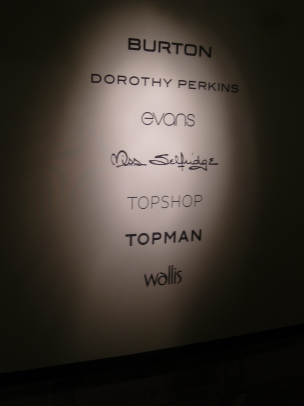 I don't really have the time or the funds to travel all the way and get around London for each press day but Arcadia houses Topshop, Miss Selfridge, Dorothy Perkins, Evans, Wallis, Burton and Topman, so that really is value for money! Haha well it is such an honour to go to an Arcadia event, especially as I study retail and all that jazz, so an opportunity to mingle with the pros is amazing. And of course I love checking out press day posts (often the Topshop one on Style Bubble) to spot things I might nab and to get a bit organised for the future. When you go shopping you can really think, 'hmmm I'm totally not going to be wearing this in four months, it's not worth the impulse.' If you plan your wardrobe direction, you'll be sorted when the time comes and can eeease into Autumn Winter. I didn't know of any other bloggers going as there was a postal invite so I went round myself the whole time and it was beyond what I expected! I'd been to some shows during London Fashion Week at Victoria House (well, two out of three shows haha), so I hopped on and off the tube and sauntered in past the posh security guards and into the basements down the marble stairs. When you walk in it's just like walking into a huge Primark; you don't really know where to look first! I was going to make one huge post on all the stores but realised I've got a million pics and it would be insanely long. So I'll split up each brand as they really deserve their own blurb. I felt a bit sorry for the other stores as Topshop got their own room whereas the other women's shops were in one big room. This wasn't a problem though as each corner was transformed and as you wandered around you were totally into each store. 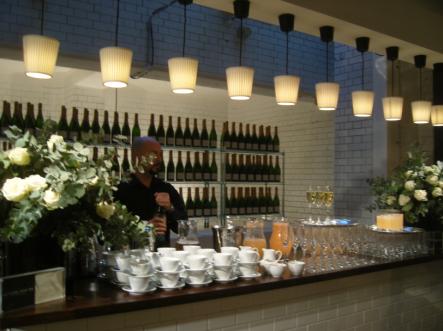 In the end I didn't sample any of the champagne or food that was being constantly offered; they even has mini muffins and little bowls of pasta! As I was alone I felt a bit weird tucking into a plate in a room full of clothes so I always politely declined, and will try find another blogger to go with next time and tuck right in! First I've got to note that these aren't the best photos as it was quite hard to snap and browse. It wasn't busy but there was always people browsing around you and in most places there were spotlights, so some things were harder to capture. I went around 1pm so I assumed most people were on lunch breaks. At each brand they had a visitors book and I had a little nose at where others were from and previous messages were from TV shows and magazines! As with fashion week, I had no idea who the other attendees were but always wondered who they could be and assumed everyone was very important! 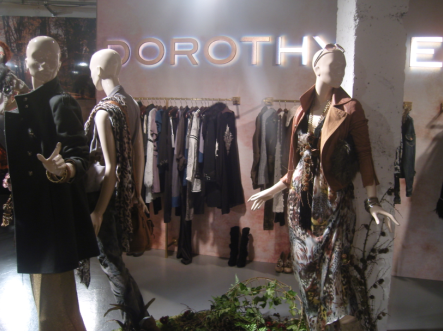 As you walked in you turned the corner and were faced with Dorothy Perkins first. I didn't understand the layout and thought it was a circle but in the end you had to go back on yourself after Topshop so I ended up admiring the DP models a LOT. 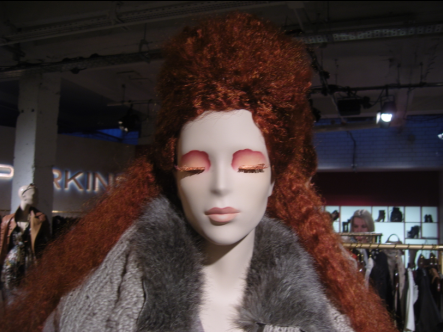 Each brand had a different way of customising their section of the room and Dotty Ps put their efforts in these amazing mannequins with huge crimped/afro hair and burnt orange lashes! I really want a crimper. Seriously. In the beginning I felt a bit weird browsing as it's not like you're shopping and not everyone is taking photos. There were many people schmoozing with drinks around the DJ in the centre of the room and people milling around each section. 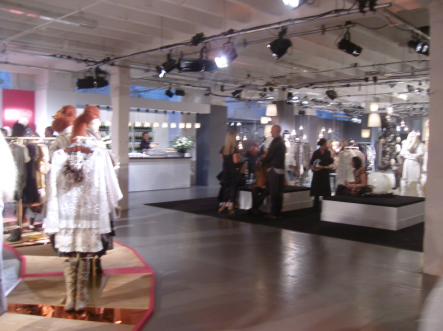 Turns out not only the press team were there but the actual collection designers were at each stand. In fact I'd assume all members of the Arcadia team were there. After all, it would be a key event in the calender and most were dressed very well with false lashes and all! 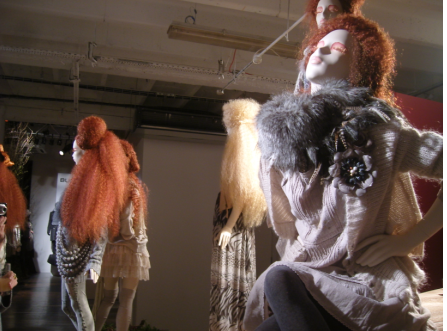 It was a real privilege to talk to the designers of the clothes that thousands of people wear, and for most, what appears in the stores is what sets fashion trends. I wasn't asking too many details and didn't write anything down but I asked what were the key things for each store and what themes they were channeling. If you can't be bothered reading the future posts, there will be a LOT of fur, tonnes of leather, all things gothic, and new directions for military; less marching band and more pilot jackets and army prints. Yep, army print! Hello 1996. I got into the swing of it and started flicking rails and getting distracted by all the new clothes here, there and everywhere. 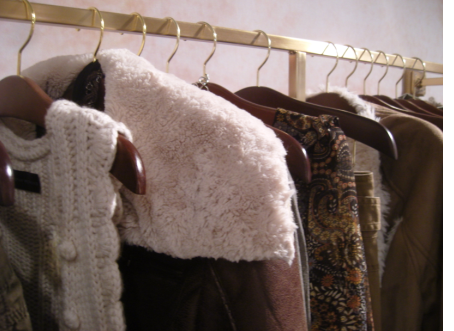 First thing you will want and need is a shearling jacket. 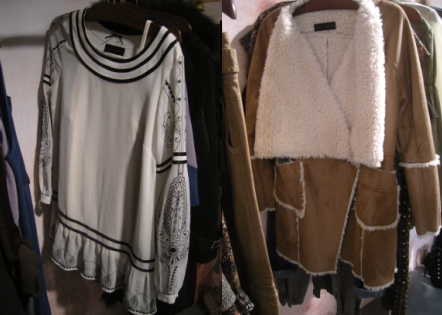 If you followed the AW10 runways you will already know this (see Burberry Prorsum), but if not, here's the memo: SHEARLING WILL BE HUGE! It's all about aviator chic. Isn't it funny how you can add chic on the end of everything and it becomes a fashion term? The DP shearling coat was my first encounter, with a lot of cowboy flavour. I wouldn't fully take on this trend with a coat as it wouldn't withstand time enough, but I'll be wearing beige and tan definitely, and will try to get a shearling scarf or some soft fur on a jacket. It's about huge collars. In about 2002 I had a coat just like this with shaggy fur all around the hems, when jeans were flared and embellished, and coloured feather jewellery were cool. I'm not 13 anymore though and don't quite know if I can wear this again! 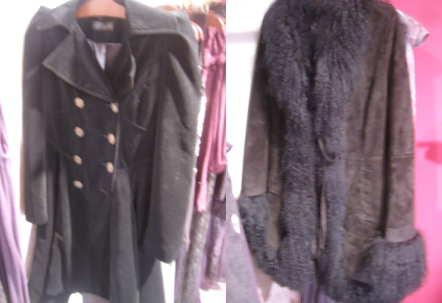 The coat on the left might not be my Winter coat either as it's part of a gothic collection, basically due to all the Twilight/vampire stuff invading the whole world. Not for me! Other shops are inspired by this too as you'll see later. Casing point! Fantastic shoes but who can wear these? I do have a furry bag from River Island a few months ago but the chain is realllly long and you can just about squeeze a tic tac in there. 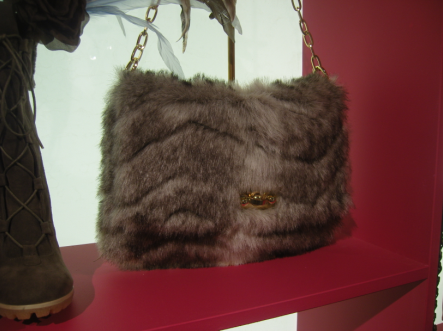 There's lots of furry bag offerings and this one is quite sweet but too classic for me. I try not to buy a Chanel shaped bag until I can afford the real thing (in the far, far future)! All the 'gothic' stuff isn't exactly too scary but it's not too ground breaking. I'd expect lots of lace and ruffle details on everything black. These shoes were an outside brand but I was glad there were some sparkles and bling somewhere! And an onslaught of furry coats. Now they are all shaggy and full and eveeerywhere. Lots of knitwear of course but it's very thick and light coloured, so it could almost be a bit twee or little house on the prairie-ish. As a wedge boot convert, I was eyeing these peep toes too, although I might enforce a black ban. It's all about tan! Unlike most, DP did have some cute details. 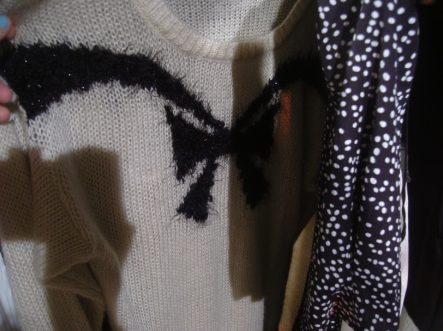 I liked this extra fuzzy jumper and the blouse below with a cat print. Not many others will be producing retro prints anymore, be warned! Also get ready for the leather tshirt in a big way. If you get one this season you'll be all set. I really want some leather shorts but haven't spotted any cheap enough on the high street. I've just been googling around and Oasis have a cool pair but they're £60. They would carry you right through winter but guaranteed somewhere else will come up with a cheaper pair. Hi lovelies! It's been very interesting to read all the comments from yesterday's post, thanks for contributing! I've been officially out of studying and work for three weeks but somehow have a million things to talk and post about! So I'm rolling them out and will time some for the weekend as there's been a stroke of luck and I'm going to Paris tomorrow. With all the flight mess and the cloud of doom, I've spent the week just waiting to see if it would go ahead (and nearly rebooked!) so have absolutely no plans! I'm visiting a fabulous friend doing study abroad too but she has a job in Paris, so cool! I am bringing fake lash supplies. I'll write some posts in the morning though and time them to go out in the next few days; I just got back from the Arcadia press day in London and might explode with gossip and lustings. I was there at the right time too because I overheard whispers of 'Philip is here' among the collection designers and press officers and sure enough Philip Green was swanning around having his first look at his retailers, wow! But first I want to talk about yesterday when I went on a shopping trip with Winnie of Diamond Canopy! We're both from Birmingham (calling yourself a 'Brummy' is a bit cringey!) and have met twice before so it was looovely to browse around together and have a gossip over Starbucks. Winnie is marvelous. 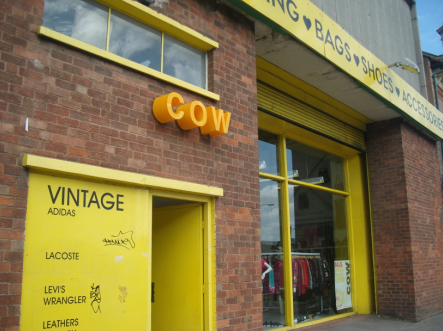 It was Winnie's idea to go to Cow, the major vintage shop in Birmingham that's five minutes from the Bullring in a huge warehouse. Everyone knew it as the yellow vintage shop for years and I mentioned it a few posts down, where I got my red dress that I made into the comic strip dress. 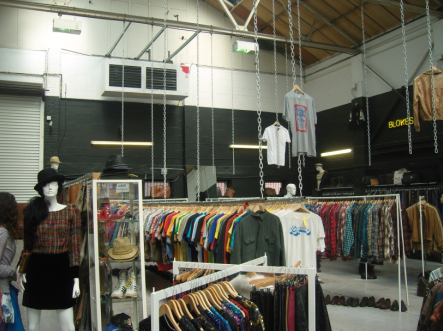 We both didn't know what to expect as over the years they went from having straight rails up and down the store to introducing customised vintage and different sections. Sometimes it's a bit hit and miss as really who wants an 80's puffy sequin dress? But we were so impressed! Before if I recommended Birmingham, I wouldn't have been so confident to overly promote the shop as most towns have vintage stores, but it's really amazing now! They must have got very strict about the things they do put out onto the shop floor as almost everything was clean, wearable, and special. 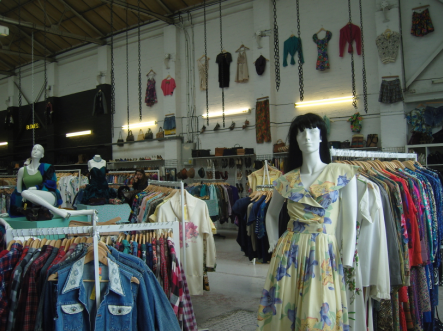 There were no filler polyester dresses or tatty t-shirts or naff smelling floor length frocks. 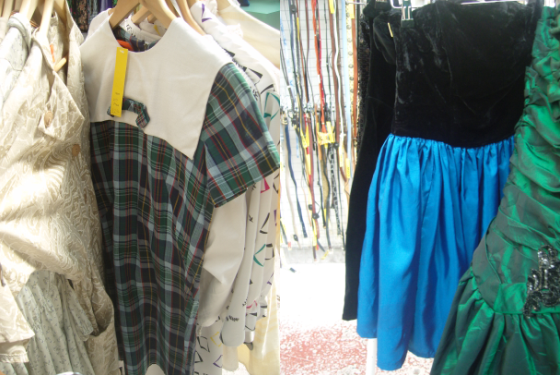 I liked this school girl dress but it was over £20; one of the higher prices. Most things were so reasonable as almost everything was under the £20 mark and you could really justify the mark ups. I also hovered over the strapless velvet dress as it was so something I would have bought maybe three years ago when I wore little prom dresses to clubs. It was in great condition too. A lot of the items had the label 'Salad' in them which seems really random but we thought maybe it was a company that spruced up dead stock? I was pondering tie-dye too for no apparent reason, and really liked this slouchy, chunky playsuit. It reminded me of the really 80's inspired Topshop Unique collection a few seasons ago. 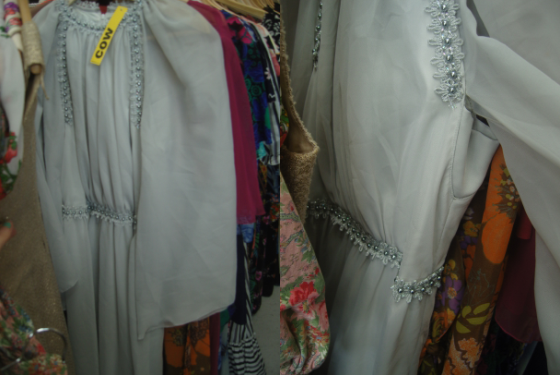 I loved this 70's maxi dress with angel sleeves but on further inspection the under arms were purposely missing! For ventilation maybe? 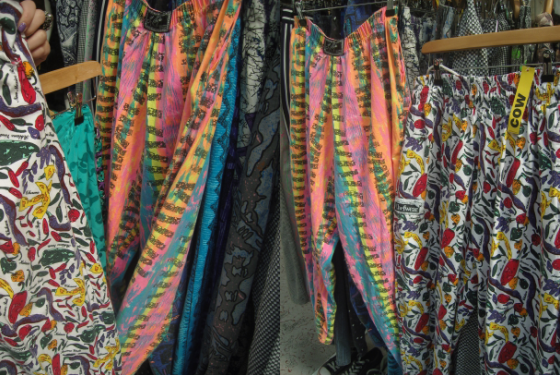 Hahaha we spotted a rail of 80's hammer pants, but even these were amazing patterns that would be hard to come across! 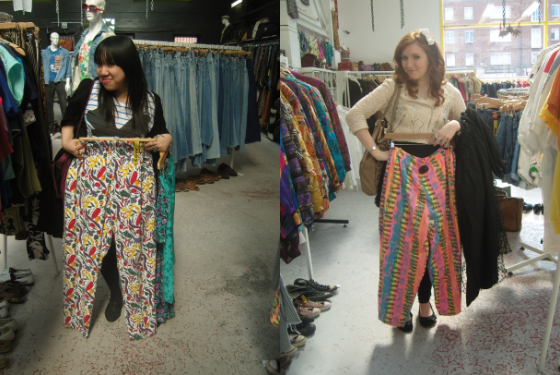 Winnie checked out the pair covered in different kinds of peppers and I fondled the Saved By The Bell-esque neon pair! Haha, safe to say we didn't purchase them! 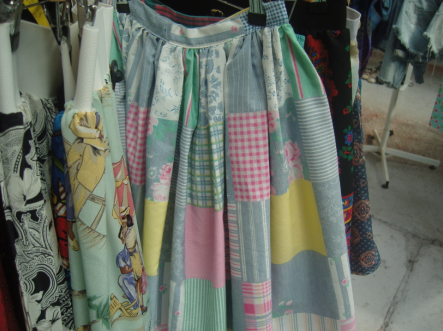 I'm not sure these skirts were vintage but I would love a patchwork or rainbow dress for summer! 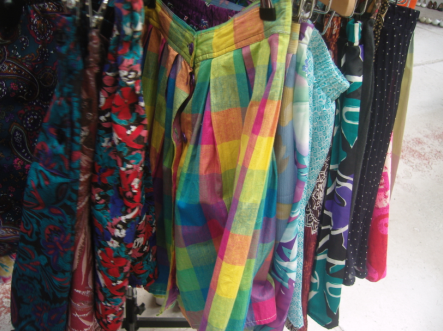 I've looked for the perfect vintage rainbow dress for years. They also have a large men's section that's at least 3/4 the size of the women's section. 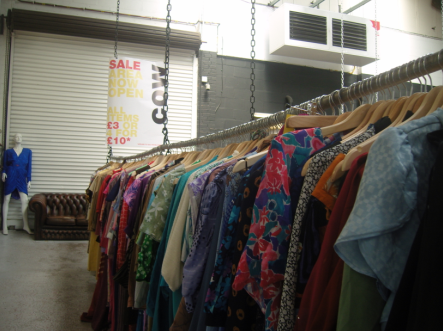 Winnie and I were very pleased to find a huuuge sale rail, all things £3 or 4 for £10! And these things must have just been in stock for a while as they weren't just the broken or stained items. I liked a pair of yellow high waisted shorts. 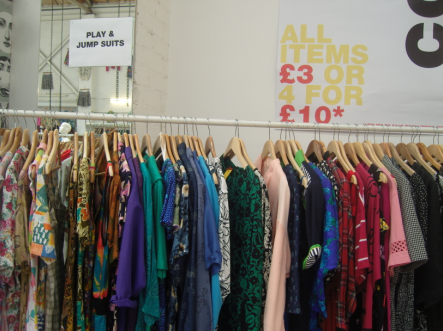 I don't think it's very common to have such a huge rail of playsuits! 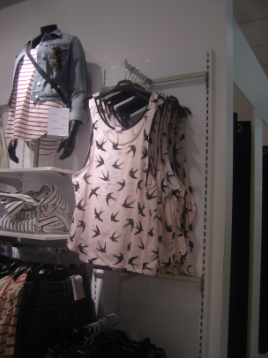 And they were all so wearable and cute. 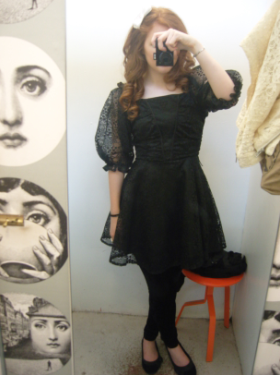 I tried on this lace dress but underestimated how large the sleeves were! In the end I got a maxi skirt that has a polka dot tulle overlay- my kind of maxi! 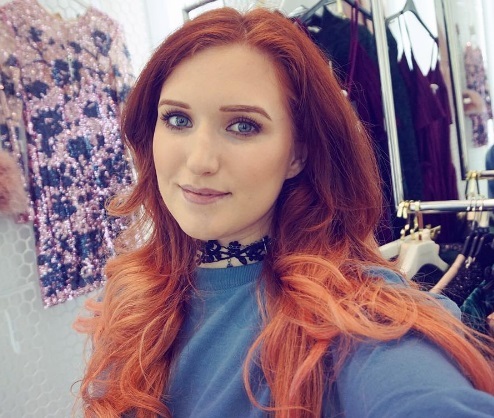 Later we browsed around Topshop and H&M and when Winnie went for a hair cut I did some damage to my card in Selfridges, and then did some more when we met up again after! I'll do a haul video tomorrow. So if you're ever passing through Birmingham, the shop is right by the new coach station and is certainly worth a visit; you wouldn't be disappointed! 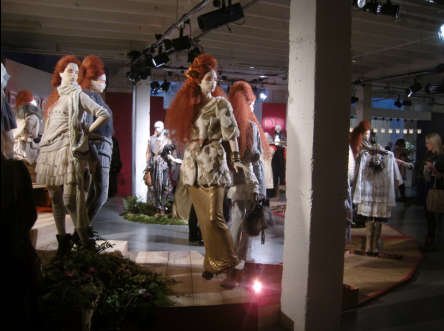 Cast your mind back, way back, to fall 2008, when Siri, Kinga and Irina walked the runway. Do you remember the Sonia Rykiel crowns? I think they were made of pearls or beads. This crowns were awesome, any excuse for a hair accessory! Well I happened to go into Glitter, a slightly more bling-y Claire's Accessories, in Copenhagen central station a few months ago and spotted some crowns made of pearls. I got one to put with my sister's birthday present maybe to wear to her party and one for myself just because they were cool! They have a heart shaped gem on the centre point but I might snap that off. There aren't so many places you can wear crowns that can transfer to day wear and not seem like costume or hen night attire, but I had to photograph my Sonia Rykiel x H&M stuff with the crown! I also waited so long because these Office velvet platforms are just like the ones in the collection, but probably ten times harder to walk in, and I'd left them in England. I don't know what to do with them! They're just impossible to take one step in, even on carpet. The platform is insane and thins at the sole so you are balancing on a very small area, and the straps have no support. Useless! I love them though so what can you do! 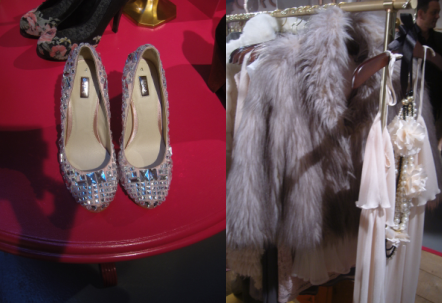 Today I went shopping with Winnie from Diamond Canopy (more on that later!) and we spotted a few items still left in store from the Sonia Rykiel collection, which was released over London Fashion Week. I would have got the over-sized stripy dress but that was sold out by the second day, when I got to the Birmingham store. I did however pick up the jumper and some socks in the best stripes ever. There is nothing more fun than a stripy jumper. I love Vlada Roslyakova! 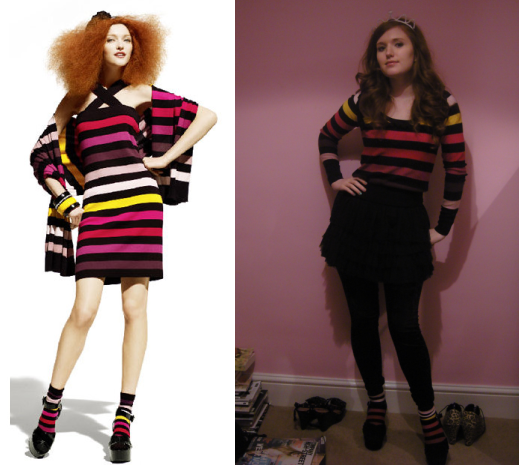 About four years ago I added Lily Cole on myspace and she said I looked like her, how random! But regardless she is one of my favourite models and looked great in this campaign. I did wonder today though how datable designer collaborations are. Not as in you can take your item out for dinner, but as in they don't look so fresh for very long. Personally I love this jumper and do actually wear it like this with the matching socks! 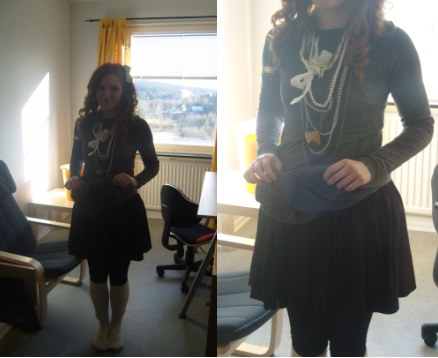 In fact I wore this whole outfit for a major final presentation in Sweden, minus the shoes. Here's the proof! I love wearing this jumper, especially with the socks, but I get the feeling that other people would look at it and think 'that's old.' Like say if I saw a Christopher Kane tshirt on someone I'd automatically think, 'Ah they must have bought that last year and are still wearing it.' I even own one of those tshirts, so it's more a case of wondering if people would think you were a bit erm, trampy? I'm trying to be as sustainable as I can recently and have no qualms in wearing things that are years and years old, but wearing clothes that are so publicised means everyone knows just where and when you got it. The majority of people won't care or would forget about the collection, but say when I intern at a cool fashion company, will it just seem a bit behind the times? A bit old and used? A bit last season? 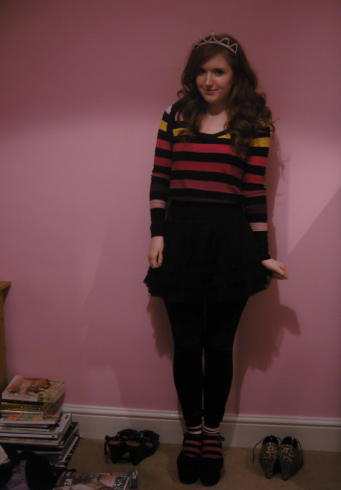 I don't know if this even matters but wearing pink and yellow stripes truly makes you cheerful, I can vouch for that! New video up about the products I'm using at the moment! If you're not into videos, I've listed the products at the bottom of this post, but if you are then I hope you enjoy. 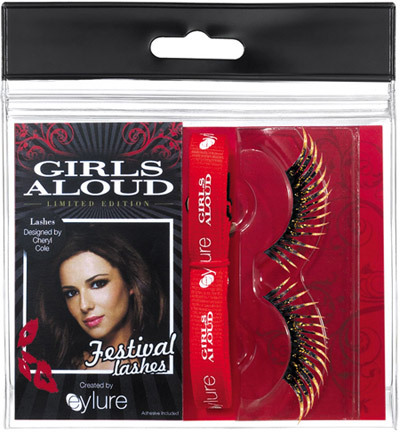 Oh my Goddd, lash lovers of the world, there's new Girls Aloud lashes!! Yay! I just ordered 6 pairs. Eeee! 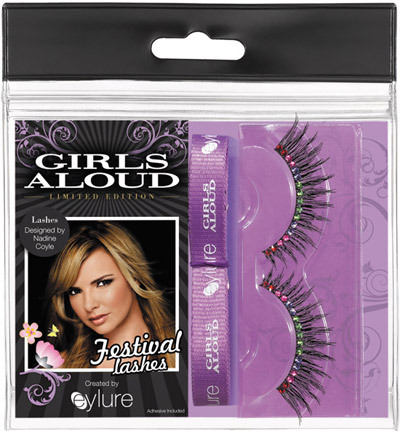 Now if you wear false lashes, you will know that when Girls Aloud were at their height last year, they released their lash range for Eylure, and they were GOOD. I assumed they'd be limited edition but they're still selling strong. My favs are Nicola's, which are super long and feathery, and Nadine's, which are full and curled. I've gone through so many pairs! They hold out about four wears for me but that's because I wear a lot of mascara and eyeliner with them too, so they could last even longer if you wear lighter eye makeup. I got multiples of Nadine's because they look extremely similar to her original pair but with rainbow gems! On the livejournal where I got these pics (linked at the end of the post), someone likened these to centipedes! It's true! Maybe in real life they're gold but I don't see why you would wear yellow lashes. 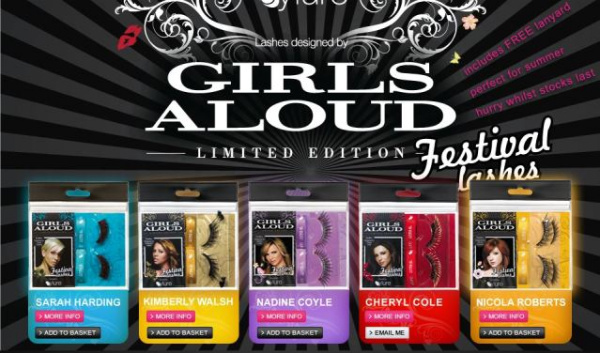 I'll have to see them in real life but knowing Cheryl's popularity, they'll be snapped up anyway. Her original pair are quite pointy so only suit certain eyes. These aren't so original as mini feathers have been done before. I have a feeling they would scare off guys as they do look like fly swatters when you're batting your lashes, but I love the spiky cut of them. I always see original Nicola pairs forlornly left on the shelf. She's grown hugely in popularity since she ditched the fake bake and became really fashionable, I hope she gets an ad campaign soon! But her look is so original that it's hard to imagine imitating it and so most might go for the other lashes. This is a shame because hers are the best! They're very long so you might have to cut the corners but they're so feathery. So I'm very excited by her having top and bottom lashes!! 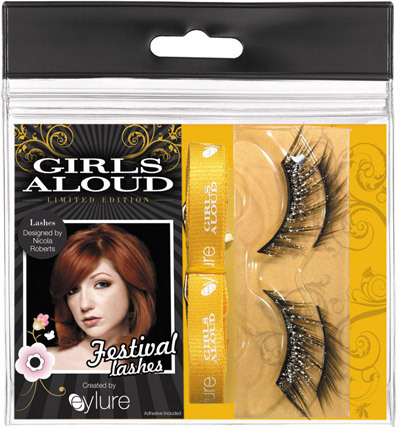 They probably won't be part of my standard night out look but for a random night, bottom lashes could look so good! I think they'd be best with a really smokey eye or lots of eyeliner at least. And it seems they have glitter in them, even better! I wonder how much say they had in their designs? Sarah's aren't for me as I wouldn't wear red on my eyes, but I bet they'd look great on really fair girls with dark hair. They look really black too which is important. I just ordered mine online as a precaution encase they sell out in-store super fast. 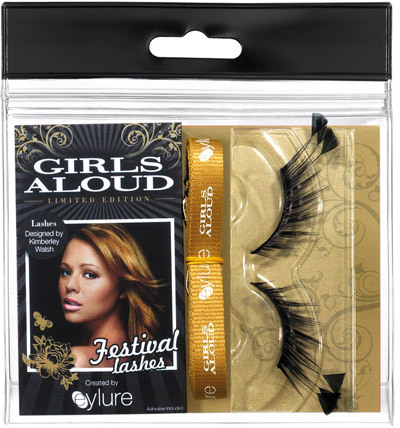 I love Girls Aloud and saw them in concert last year, but these lashes are fabbb. 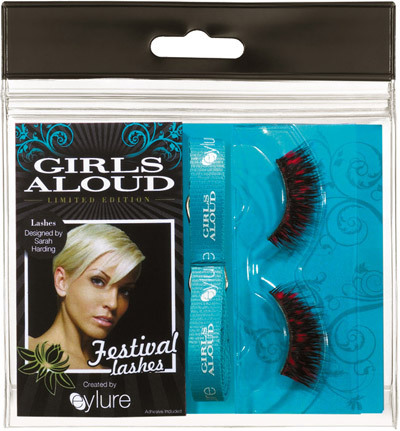 I only ever really buy these and then really cheapie lashes from poundland and use them with expensive glue. Maybe I'll do a youtube video on lashes. Thirty pairs and counting! I'm passing on the holy grail of shoes. 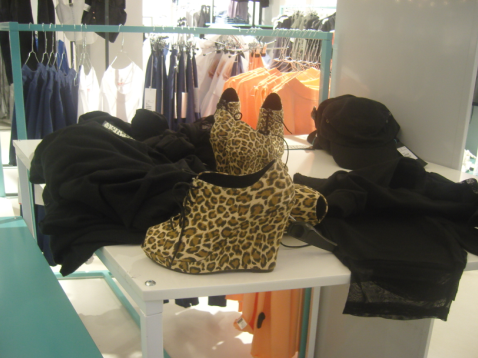 The Weekday leopard lace up wedges are amazing! These shoes are a dream. And I keep seeing them pop up online and I'm about three weeks behind in my google reader, so I don't think they'll stick around! I'm not even one of those incredible bloggers who wears heels every day. I wear heels in the daytime probably about once a month, but I'm wearing these all the time! 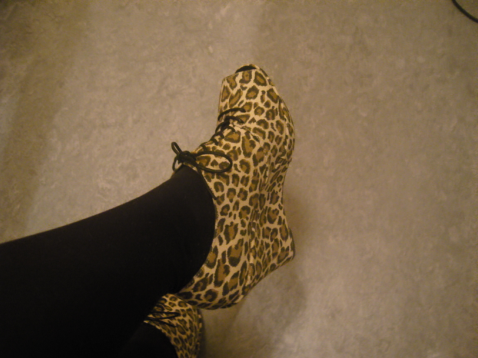 I was a bit dubious to wear these to London but they are the easiest heels to walk in that I've ever had. It feels like you're almost wearing flats, honestly! And they're unbelievable light. I went across London on tubes all day and I (touch wood) didn't trip once, and it's so easy to wobble on wedges. I even ran up and down flights of stairs for my train! They're also great quality and less than £50, bargain! They feel so low yet give you height. I recently got a thin pair of leopard courts from ASOS but they were too slim, so don't worry if you're in between sizes and these are roomy due to the laces. Don't worry about the peep toe because you can hardly see anything. They're also very low so they're flattering, unlike some shoe boots. Because they're laced up wedges, you can wear them with skirts without looking overdressed, and as this lady proves, they look great with trousers too! I saw the pic on Fashionista and the lady is coincidentally Swedish, and funnily enough when I was walking through Covent Garden a girl stopped me and asked where my shoes were from. 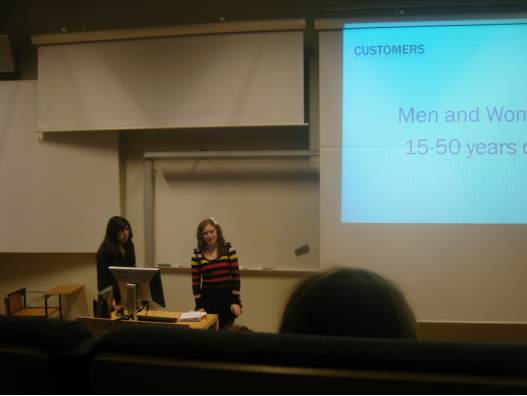 I said they were from a Swedish high street store called Weekday and she said 'Oh! 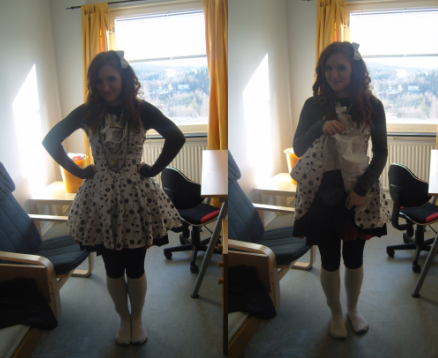 I'm Swedish!'. So if you love Swedish styles, these really are for you! I wrote about these and managed to find them in Gothenburg, but you can use Filippa's Personal Shopping Concept to get them. I used this before and it's very fast and easy! 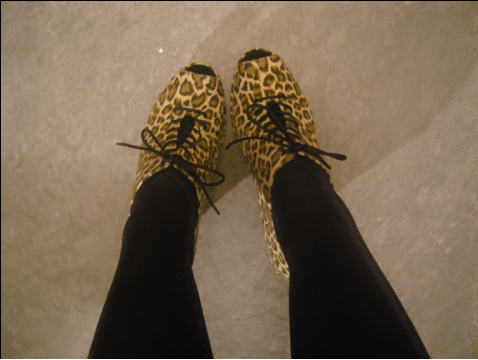 And check out this lady on Facehunter with her Topshop boots; leopard shoes go so well with black! 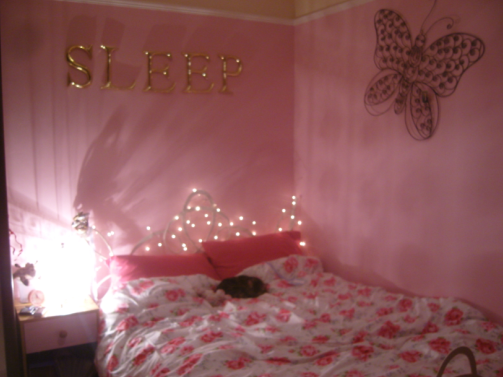 You guys know that I posted about my room being painted pink and showed the photo my Mom sent of the wall colour. 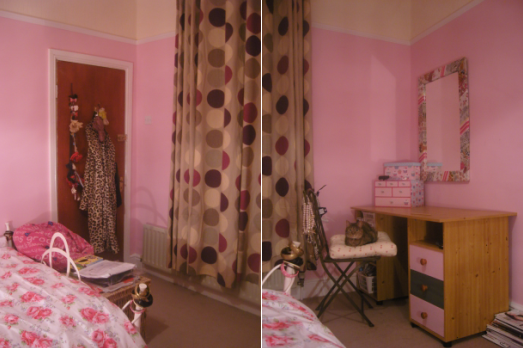 Well my friend drove us home on Sunday night and I went up to see the colour and woooooah the whole room had changed! I hate surprises so I was totally shocked no-one said anything about it as it's amazing! I've never had a room of my own because our house used to be a guest house so my family and I slept on the below-ground floor, which were basically basements. I shared a huge room with my two younger brothers and younger sister up until I was about thirteen, which by then I really hated and my sister and I would rearrange our half all the time to create our own sides divided by the bunk beds. My parents got rid of the guest house and when they split up everyone moved upstairs and I went into my parent's old basement, which you'll see in early blog posts. I was an avid charity shopper then and it was huge so I filled it with stuff and my friends always, always stayed over after nights out. 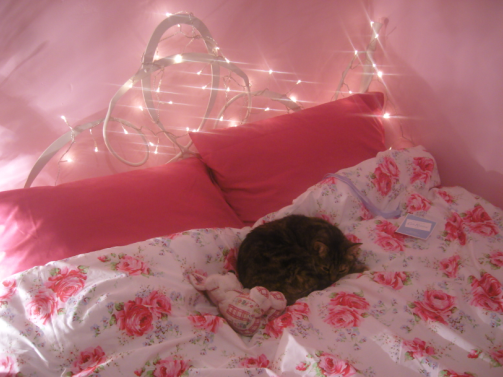 But after a while I got a little freaked out sleeping all by myself at the bottom of the house and started sleeping in one of the spare rooms, and my brother moved back down and filled our old room which is like his own flat now! So I didn't mind giving my other brother my old bedroom for good and staying in the brown and green spare room, but over these few years it's really annoyed me how I didn't have anywhere to keep anything or anywhere permanent to have my own space. Still I only wanted it painted though and that would be enough, but my Mom totally did it all out! I still have that same wardrobe, desk, and bedside table but there's a new mirror with a fabric frame and really long spotty curtains and the best part, a double bed! I said once in passing randomly that my brother has a double bed and I'm still sleeping in the spare room single bed even though I'm 20 now, and my Mom got one with a curly white frame and got Cath Kidston bedsheets. 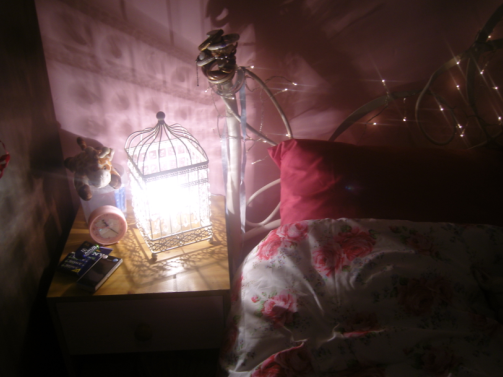 There is a birdcage light from her room and fairy lights around the bed, and big gold letters spelling out 'SLEEP'' on the wall and a butterfly frame. The cat hasn't moved from this spot! Ah love the cover! 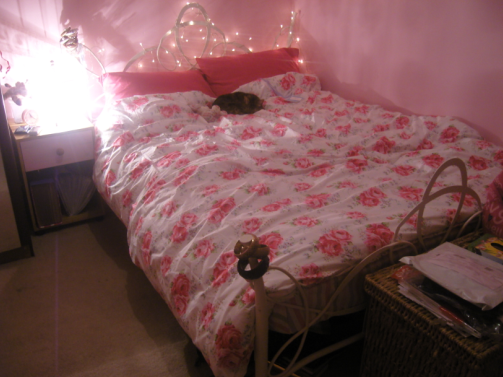 There's a stripy bedsheet underneath too! It was all done cost friendly though because the drawers of my old dressers are just painted and things were picked up on sale. I only know the bed was from Argos but I can ask about the rest. The 'S' from the sleep sign actually fell down yesterday because it was on sale as it had broke in half, and then my curtain fell on me and the cap ripped my cushion! The cats love it in here and nestle themselves on the bed; in fact I'm fighting for space on my chair right now as one is curled up behind me! I've unpacked now but I've tried to keep everything put away. It feels like you could lay a lot of things out to make the room look cuter like rows of nail polish and magazine cut outs, but really it's so much more stress free and calm when there is lots of space; and once you have your phone and diary and bag and maybe a drink around you, the space is filled anyway! It signifies hopefully a productive summer and I'm looking forward to starting back at Manchester prepared and ready. A while to go though! I also made a video of the room so you can get a better view and talked a bit about it. Not sure where to take outfit photos though, maybe against the curtains or the pink wall? It feels really weird to have a room of my own; first time for everything! Hi guys! It feels like a long time since my last post but it's only been a few days! So much has happened, I've moved back home to Birmingham in England from Sweden and have hopefully finished the main part of my Erasmus year. What a year! I hope you've enjoyed the posts from there, from rare but detailed shopping trips to Gothenburg, to gossip filled trips to Scandinavia and beyond. It's been so useful to have a recorded log of all my times and feelings, and so thank you for being there to share it with! 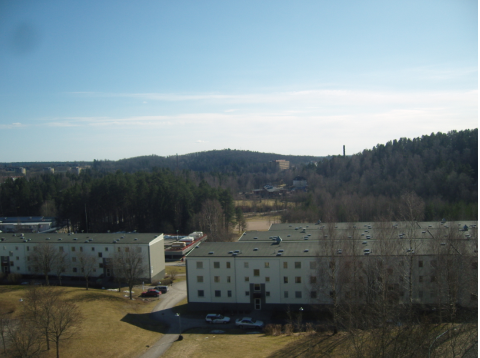 It's all a bit up in the air at the moment as I did leave earlier than normal, but Swedish Unis have four terms and I completed my credits in the first three. As there's not a lot to do in the winter months, I couldn't face staying indoors doing nothing for two more months and I'd spend the time instead travelling to see other Erasmus friends, so I might as well go from home! Saying goodbyes was very hard though as all the people I've met live in different countries and continents, so it was the last time I'll probably see them again. Despite being a Leo, I did not want a huge hoo-ha and managed to say a quiet goodbye to all of the special people I've met and most of the faces I've know for this term or the year. 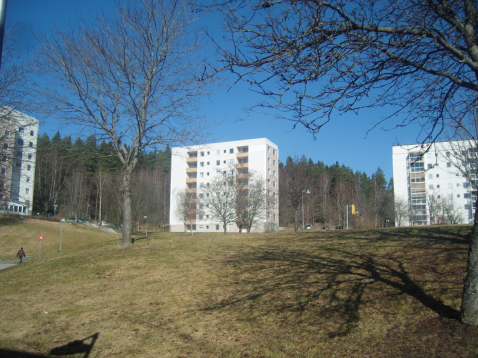 The day was especially strange as it was the first sunny day literally since about September. The weather looked exactly like it did the very first day I arrived in August and from my window the clear sky stretches out forever. It took so long to clear out all my things and I left behind over 20 Elles, Glamours, and various others like a Pop and a stack of Looks. I also had a humongous box of toiletries as it was impossible to time everything so I used the last drop of shampoo on the last day or the last squeeze of face wash. I was so ruthless with my clothes and shoes and didn't bring back any towels or my hairdryer or sheets or basically anything that I could buy again. And still my cases wouldn't get under the 30kg mark and I paid £80 excess baggage fees!!!!!!! Painful!!! But by the time I'd carried over 40kgs, that included the excess and hand luggage, to Gothenburg and then on to the airport, I just accepted I had to pay; I'd whittled everything down so much! I did however stress I would wear as much as I could to the airport and my good friend Chi documented it for me. I left half my wardrobe and text books with him so he'd better come visit me in England this summer! 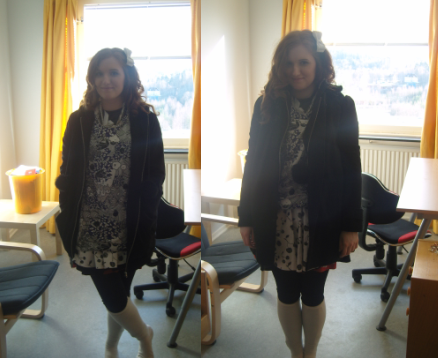 He kindly documented what I wore, which I chose as my heaviest items or things I could layer easily. First I had on a H&M ballerina style dress with stiff tulle underskirts and a Topshop purple long cardigan. Over the top I put my ASOS long-sleeved maxi dress but tied it at the waist in a big knot so I wasn't dragging it on the floor and getting caught in my case wheels! 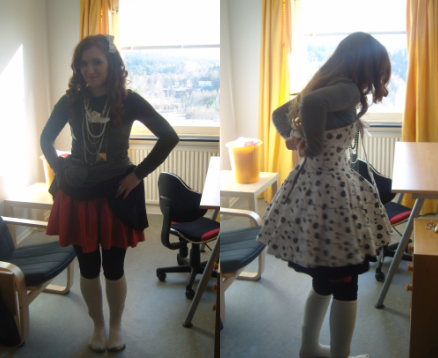 I also wore alll my necklaces and some thick shiny nylon/spandex leggings by Chelsea Rebelle with bows on the back and knee high Topshop wool socks over the top. I put my red skater skirt underneath that I made as a fresher and a heavy Topshop 50's style cherry dress over, which I couldn't do all the way up by now! 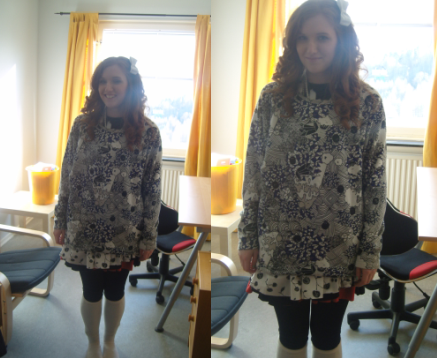 Then I put my Monki sweater over the top of everything, which made me look pregnant and insane. Then my Monki hoodie with pompoms went over and eventually my New Look swing coat, that by this time couldn't actually do up! From every angle I was bulked out and generally looked like a crazy bag lady. The sunny day turned out to be bad as I was very hot all the way to the airport, which took three hours, but never fear, I was quite comfy on the plane! I came home to a big surprise that I'll share with you tomorrow, and I'll made a video too! I also want to do a big post wrapping up all the things I bought in Sweden and maybe all the things I've done if you're interested, but I can just keep it to the clothes! I do have plans in the next months hopefully but I'm putting all my efforts into great blog content and creating up-to-date posts always. Am I allowed to make religious puns? Well it is Easter! 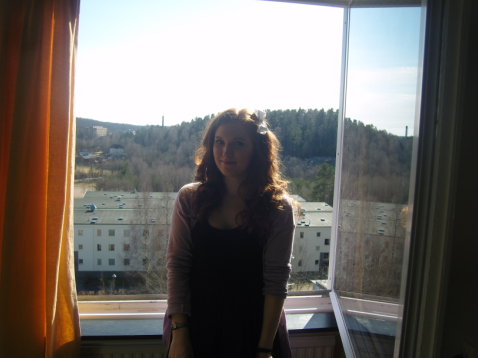 And today was the last shopping trip to Gothenburg, sob sob. Well it's not sinking, I can return one day, but it is very sad. The end of an era! It almost was the end of all era's when I ended up a bit stranded on a motorway, but that's a different story! So I rushed around doing errands all morning- you need SO many forms for Erasmus! And it's going to be a nightmare journey again with dreaded Ryan Air and some how getting through London with three cases at midnight. 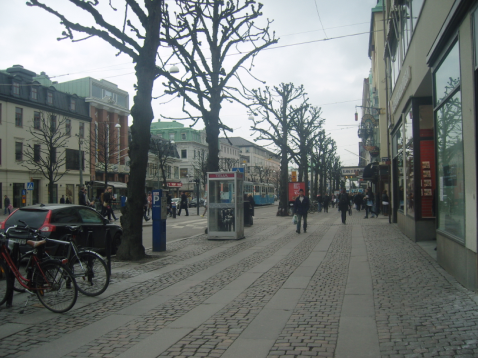 I just about made the bus that I'd planned to get just after lunch time and in an hour I was in a very busy Gothenburg. It reminded me why I always shop on weekday mornings because I was constantly dodging people and hovering on rails waiting for people to browse faster and generally going slowlyyy. All the schools are off of course! 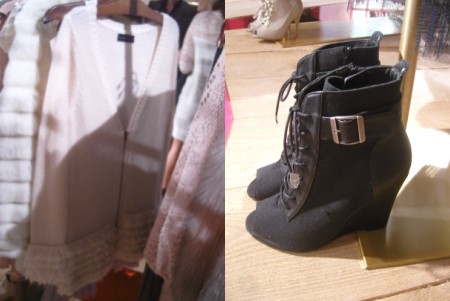 But despite H&M being a let down, I actually found the things I was looking for later! This never happens. 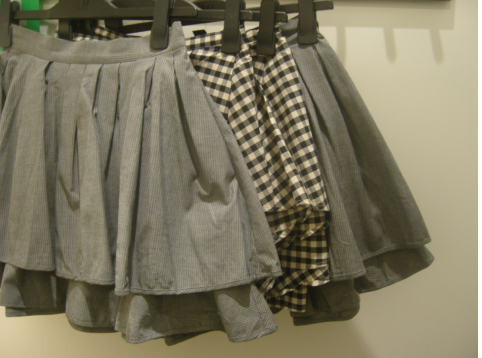 I did try these H&M skirts but realised grey really isn't my colour. 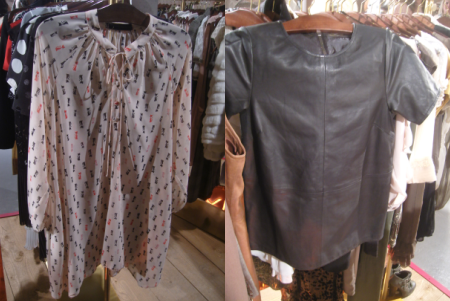 Also Gina Tricot is really pushing the Miu Miu print rip-off; the shirt was cute but nothing special. I headed to Weekday and found the leopard shoes I posted about! They didn't have my size out and I assumed they'd sold out, but on a whim I spotted an SA and she retrieved me a pair! Again, you can use Filippa's shopping service if you want Swedish stuff as I recommend these booties, they are so comfy! And they're roomy and don't feel high when on as they're really light. I thought the way they lace up might hit an unflattering part of the ankle but they're cut quite low so your legs don't look stumpy at all, and the peep toe is verrry small. I haven't worn peep toe in years! I was so surprised to actually find them that I took them to the counter straight away, and they were only about £45. They're canvas, and considering Weekday sells t-shirts for £20, that's really good! I also hovered over these Cheap Monday jeans because I always turn to trousers in Spring for some reason, and they looked seriously cute. Loads of people were trying them on though and I took a step back and though hmmm, if they weren't Cheap Monday I probably wouldn't be so attracted to the farmer vibe. Also all the changing rooms were full for ages, and Weekday have those weird mirrored cubicles where the doors are two feet off the ground and only come up to your neck, so you can see exactly who is in there and people can just walk past and look over the door! It's almost like you must be totally gorgeous and confident if you want to shop in Weekday. 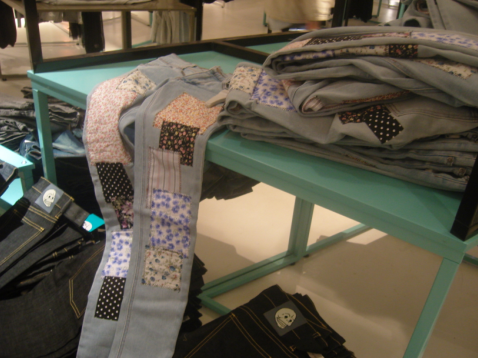 Shopping for jeans takes lots of trial and error so I decided to leave them, despite a cute SA asking if I needed help. I'm going to miss all these well dressed guys!! Also whenever people speak Swedish to me in shops (as in every time) and I say ah I'm sorry, can we speak English?, they always say 'ohhh, you look Swedish!'. And how do you look Swedish? Ditch the eyeliner, people! I don't wear any anymore and it's fabulous. 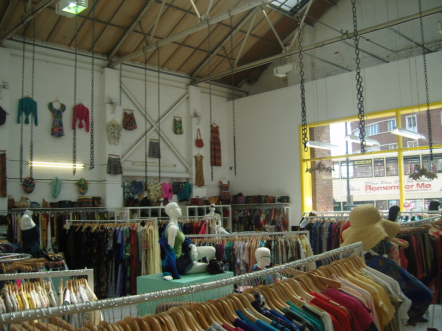 I also went to Bik Bok, Zara, Topshop, the other Weekday, three Monki's, Ahlens, and Din Sko. Sweden definitely does winter better than summer, I just didn't see anything exciting. 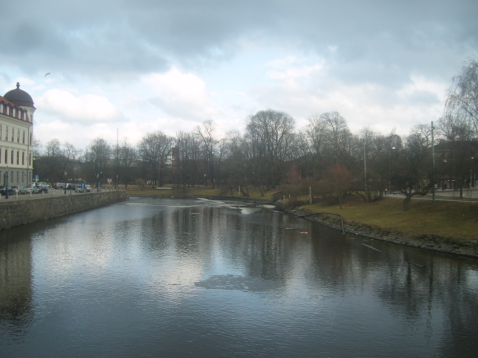 If you're wondering, Gothenburg is right by rivers and it's a mix of old trams and massive new malls. It's not as traditional as I though it would be. I popped into another H&M and found it to have much better Divided stock than in the main mall, and found a jacket I'd been looking for too! I'd asked an SA in the mall if they were sold out in-store as well as online, and she gave me a pitying look and said 'aww no, that jacket sold out', so I assumed it was loooong gone, but then found loads in the nearby H&M! It's like a mini biker jacket but in cream lace, I bet they're in the UK soon or now; I'll post it when I can take an outfit photo! I started feeling really sad in Monki as you just can't get the strange, over-sized cuts anywhere else in such crazy patterns. I wanted to buy up everything! 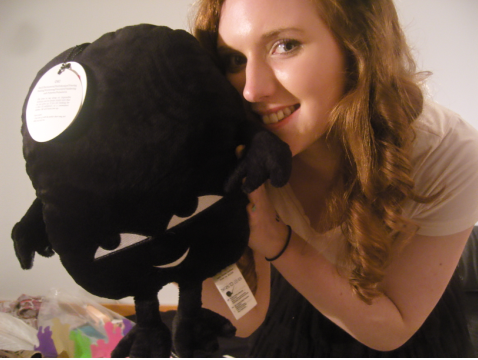 But in the end again I got what I came for, a Monki teddy! You know their logo are these little Monki animals called 'Monki friends' and they have teddies all around the store with different faces and in different colours. I knew I wanted one since I first came here because it's the best memento of my year abroad and the great times I've had shopping in there with friends and even myself. Instead of sticking photos on the wall, I can always have the teddy in my room and it will represent the time when I could visit the best shop ever! It really is an important Swedish shop! I wanted the pink one but I picked the one with the nicest face and it's called 'Oki' apparently! Thank god everything I bought today is really light, even the shoes, as tomorrow is packing D-Day. Will everything fit? Nope!